Dr. Daniel Curtis presenting his talk at, “Making the Medieval Relevant” at the University of Nottingham. Another fascinating paper from Making the Medieval Relevant conference was given by Daniel Curtis, a specialist in Social and Economic History, and a professor at the University of Utrecht. 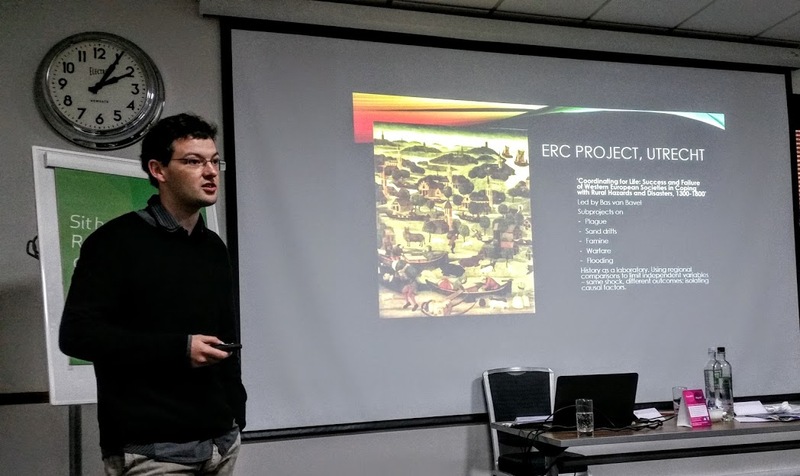 Curtis is currently part of the research team involved in the Eric Project, which studies the success and failure of Western European Societies and how they coped with disasters, plague and rural dangers. in his presentation, The Shock to Reinvigorate Medieval Economic History, Curtis spoke about why some societies in Europe were able to cope better than others with exogenous stresses such as plague, sand drifts, famine, warfare, flooding. Curtis switched the focus from the usual special events, like witch hunts, the burning of Jews, and massive riots. Why did other societies not fall into these behaviours during difficult times? Why did some epidemic diseases incite hatred? Curtis is part of an investigation into economic inequality, the extent of blame, persecution, hatred, and violence after early modern plagues in the Northern Low Countries. Curtis is also quite concerned with the current state of medieval economic history; “At the moment, medieval economic history is in danger of disappearing entirely.” Economic departments are often separate from history departments, leaving medieval economic historians isolated and left with less than optimal resources and support for their endeavours. Curtis mentioned attending a massive economics conference in Kyoto recently and struggling to find other medieval economic historians. The difficulty for medieval economic historians is that funding bodies expect “societal relevance”, and they assume medieval historians do not solve contemporary societal problems. This presents a problem, and leaves medieval economists fighting an uphill battle to get adequate funding and a voice for their work. How do we fight this? Curtis suggested that medieval economists show more confidence, become assertive, get out of the archives, step out, and share their analysis. One good place to demonstrate the relevance of medieval economic history is the blossoming field of disaster studies. The dominant disaster discourse exuded by the Church was not always the blanket societal response. Many societies fell into crime, cannabalism, and even infanticide, in the wake of floods, plagues, and famine. Curtis pointed out that some of the most severe riots occurred when people (on the recommendation of the Church) were banned from attending funerals for loved ones who died of plague, or prevented from drinking during this difficult period. When people were thwarted by officials from engaging in regular rituals, violence ensued. How Can Medieval Economic Scholars Make a Contribution? The problem with disaster literature is that it tends to focus on the short term; medieval economic historians are able to help extend research because they can step back and look at a longer period of time; centuries, and not just decades, “We as historians, are in a good position to provide some long term perspective”, Curtis added, “New scientific research is being performed on diseases like the plague. Laboratory studies have uncovered exciting findings. We can use our expertise with historical evidence to open up new questions for biologists and scientists.” Historians have challenged scientific evidence because unanswered questions still remain around statements like: ‘Distinct clones of Yersinia Pestis caused the Black Death’ or ‘Genome Sequence of Yersinia Pestis: The Causative Agent of Plague’.